PC Games > Time Management Games > Shop It Up! Shop It Up! is rated 4.5 out of 5 by 22. Rated 5 out of 5 by SoulsRival from ADDICTIVE!!! Firstly all I can say is DOWNLOAD THE FREE TRIAL ( You be Hooked) There is very few of these TM' games that make it through the free trial and into my purchased games list, this game defiantly made my purchase list. It stole my attention and addicted, when the trial suddenly ended I couldn't purchase this quick enough to continue playing. 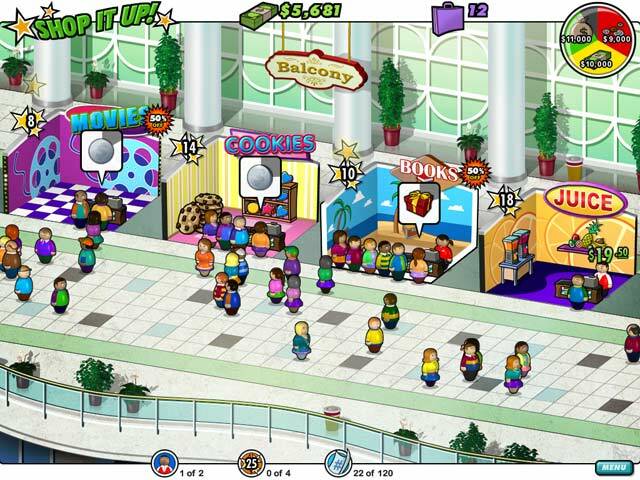 Whats not to love than creating and managing your own mall & decorating them. You have so many different category's of shops from cookie store's to juice bars, coffee, candy to Fashion stores, book, dvd's to entertainment ETC....... You can decorate the walls, floors and signage wall stock the different selections and colors are impressive. The game play is not over the top like most of these sort of games its achievable without being stressed out and curling your toes yelling at your PC screen and getting frustrated. You create your stores in sections of the mall you manage stock, hire staff pay staff step in collect money when staff want vacations, occasionally have to spot different ppl in the mall to get extra bonus's, advertising from 50% off sales to newspapers to radio adds to billboards . Graphics and overall game play Excellent, Hat's off to the creators & BIG THANKS to BF for this game. Rated 5 out of 5 by littlehalle from Great time mgmt game This is a good one. The graphics are good and it's challenging. Rated 5 out of 5 by Aamaretto from Super cute, super fun tycoon game. 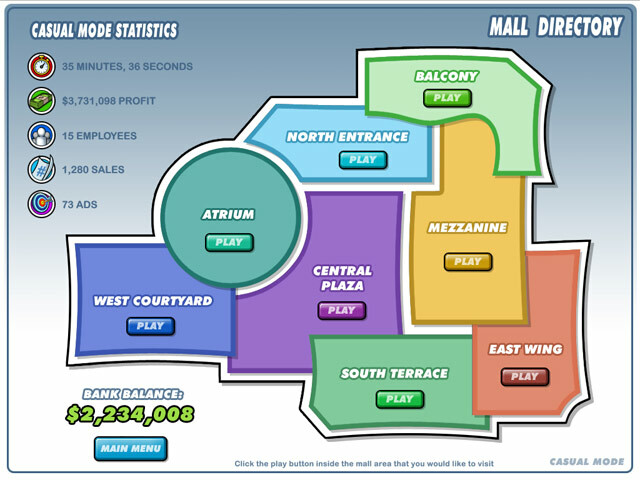 This is a tycoon game, where you open shops in different areas of a mall. 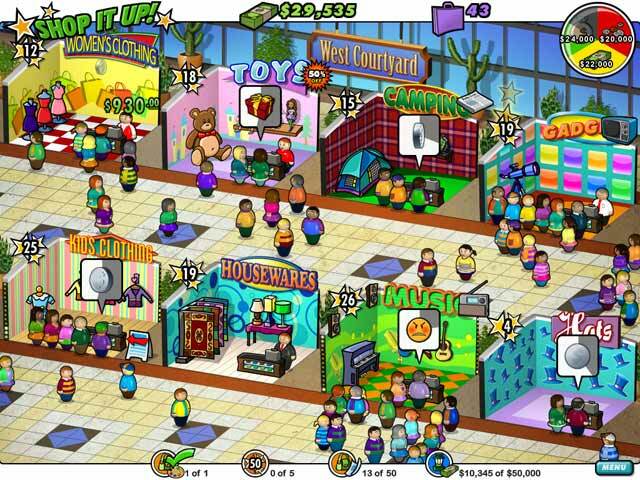 You gain access to different upgrades, starting with decorations and moving on to displays, better employees, and "flair." This is the game that got me to resubscribe to BFG after a year away. After an hour of playing, I HAD to keep going. 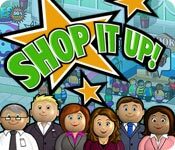 The level of challenge is moderate, once you understand what you should do: Spend all your money before the level ends by building up future shops because you don't get to keep it to start the next level. It still presents a challenge, though, so it keeps me on my toes! I've been playing it over the past day, and I'm almost done, so I wish they had made it longer. I also wish they had given the option to go back and replay levels that you got less than gold/green on. But those are small drawbacks, and not enough to rate it down from FIVE STARS. Excellent game! Rated 5 out of 5 by sapoe from great! I trully enjoy playing this game 'til end! Thanks dev! Rated 5 out of 5 by sgbmom from :D Beyond addicting! It's as simple as that. Rated 5 out of 5 by ZULLY from So much fun!!! This game is easy to play and very addictive. I love it!! Rated 5 out of 5 by Lolaliloo from Fun and simple I am enjoying this game, i find it different :D dont let the graphics repel you LOL, its all about the game play. simple, fun, and its not a HOG O__O try it you may like it!!!! Rated 5 out of 5 by Batstrings from An hour already?! This one really surprised me. I wasn't expecting a lot from the screenshots but was really surprised when my hour trial was over! It's a different kind of time management without running frantically all over, and while at first it seems simple each level was leading into a faster pace but not so crazy it was annoying. I really liked this one to my surprise.